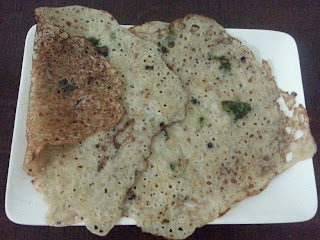 This rava dosa recipe comes handy on days you are too tired or busy or have a lazy day. It requires no grinding, no fermenting, no waiting.. just chopping, measuring, frying, mixing and roasting. It tastes really good too. What more can you want? There are several recipes for rava dosa with majority of the difference in the ratio of ingredients. This works best for me. 1. In a mixing bowl add rice flour, rava, all purpose flour, salt and mix well. 2. Add some water and mix well without lumps. 3. Add more water and mix it to a very thin watery batter. 4. In a small pan heat 1 teaspoon ghee. 5. Add mustard seeds and add onions when it splutters. 6. 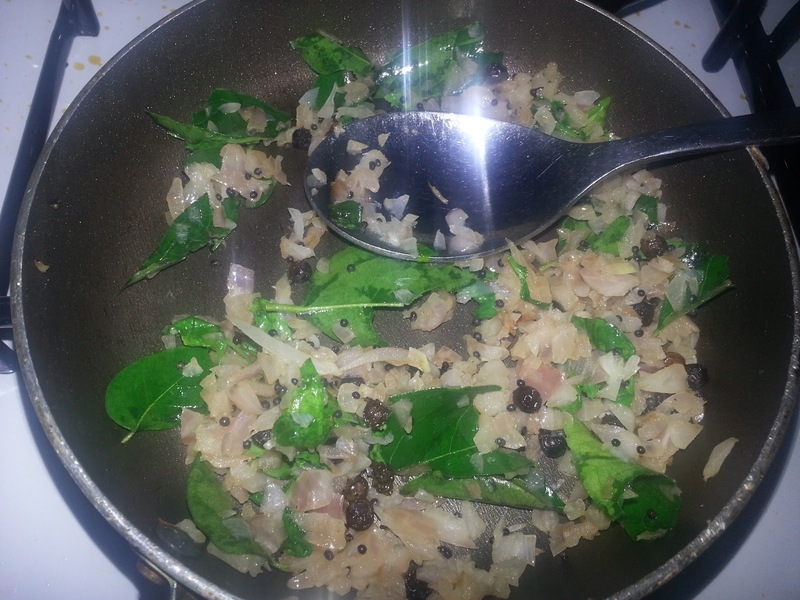 Add the peppercorns, green chilli, coriander and curry leaves and fry till onion turns translucent. 7. Add it to the batter and mix well. 8. Heat tawa, on a hot tawa pour a ladle full of batter first forming an outer border and then filling the inside. 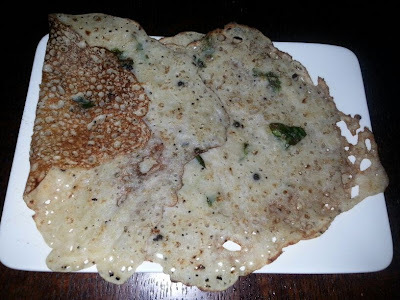 You cannot spread this like a normal dosa. 9. You will make fun shapes for sure. A perfect circle is tough. 10. Drizzle some oil or ghee and let it cook. 11. Flip to the other side and cook.